Richard “Not the Gay One from Survivor” Hatch is precluded by non-disclosure agreement from even beginning to think about hinting at any spoilers for the upcoming season four of Battlestar Galactica. 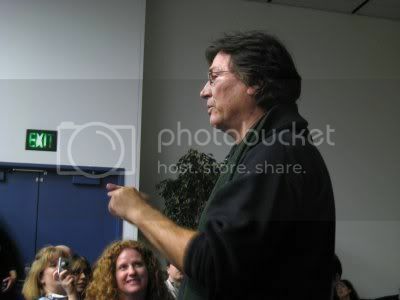 But during his Q&A session today at WonderCon, he did to some extent assuage fears that the writers’ strike had done any significant damage to the upcoming season starting April 4 on the SciFi Channel. [They] should be able to complete all twenty-two episodes. [The] actors’ strike may very well happen in June. Kyle’s mom from South Park says: “What, what, what, what?” No telling yet if that strike will affect the show. Here’s something we do know: Hatch–once again–did not fail to entertain with his exuberant perviness (TM). Ok, so it’s basically the same joke he made last year. But you’ve got to wonder about a dude whose go-to material paints him as a shameless lech, right? Eh, whatever, it’s great blog fodder, and that’s what keeps me coming back. Well played, Hatch. Well played, indeed. There are some very juicy women on the Battlestar Galactica! Yes! Wow. Juicy? If we had given him another ten minutes, would he have gone off on President Laura Roslin’s sweet ba-donk-a-donk? Ok, let’s count the number of juicy babes I’d like to boff. Laughter ensues. I think about the sleep I’ll lose tonight knowing that I missed capturing that image with my camera. I’m not one for drugs, but I think the SciFi Channel should take a lot of drugs. Sure, that makes sense. Since people on drugs are so well-known for their punctuality. I hope to God this isn’t the end for Battlestar. Yeah, I should hope not, Richard. Unless God has another acting gig lined up for you that I don’t know about. 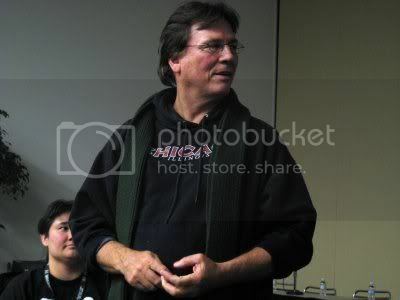 Thanks for the memories, Richard Hatch. See you next year, when you’ll be promoting your voice acting gig in Battlestar Galactica: The Fan-Produced Web Cartoon. That Hatch is kind of creepy, isn’t he? I can’t wait for BSG to come back! I really hope the actors’ strike doesn’t happen. I thought I read something about George Clooney trying to head it off with his diplomacy and negotiating skills. Come on! I have to find out what Starbuck’s Special Destiny is! George is the man. If anyone could head it off a strike, he could. In fact, I’m thinking of staging a strike just so he could head me off. P.S. Oh yeah, great post, GWS. Looking forward to more. Hmm, so if Kristin Bell is your celebrity crush, what does that make Hatch? Previous post: Upcoming WonderCon Coverage: Geeky Movies, TV, Comic Books, and Costumes Galore!